Bank Mills – Just Stop and Paint It! Continuing the â€˜Creeks and Rivers of Silicon Valleyâ€™ year long quest. Starting in 1847, the little pioneer town nestled in the foothills of the Santa Cruz mountains of Santa Clara Valley had been called Arroyo Quito, Campbell Creek, Campbell’s Gap, Tollgate, McCartysville, and Bank Mills over the years. In the middle of the Civil War, the townspeople came together to decide a permanent name. Just upstream from their town was a spring which had almost the same chemical content as Congress Springs, of Saratoga Springs, New York, so they named their small town Saratoga, and it remains today. Once an industrial town, producing lumber from the nearby hills, flour mills, paper, cardboard, furniture, tanneries, much of the power was derived from Saratoga Creek. 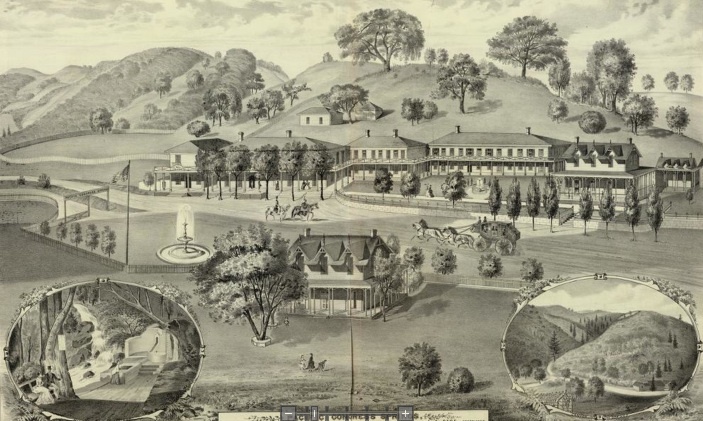 A large resort was constructed at Pacific Congress Springs, , which burned down in 1903. More history can be found here. Today, Saratoga is one of the upscale communities in Silicon Valley, with its small town feel of tony boutiques, little shops and high-end restaurants. In it’s short downtown of about 5 blocks it is, in my opinion, the highest concentration of the best rated restaurants in the San Francisco Bay area. The winding roads in the surrounding hills reveal estates with personal vineyards, horse stables, and other indications of affluence. Riding through Saratoga on my Harley-Davidson Road King every few months into the Santa Cruz Mountains, I always love to see Saratoga Creek as it runs year roundâ€¦even through all the recent droughts. It would have been nice to paint the Congress Springs area, but it is now grown over, and access is limited. (Based on my observations from the road, with it’s chain link fence, it is probably used as a water source for Saratoga.) 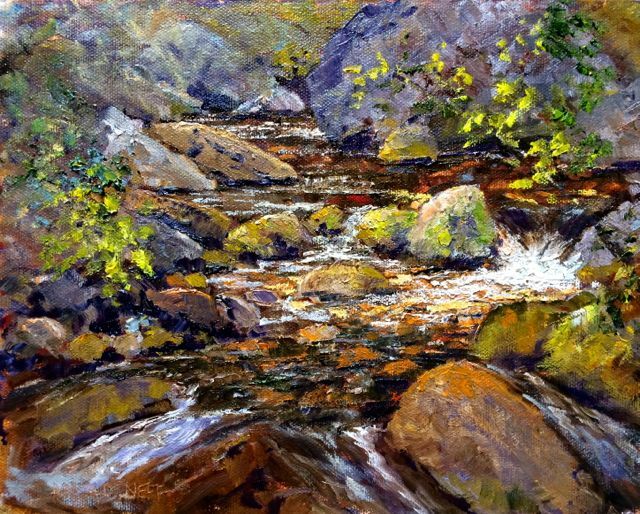 I painted Saratoga Creek downstream from there as it flows through Wildwood Park in the middle of town. Click this link for a map of all painting locations.